Eligibility: The competition is open to all graduate students specializing in CAD currently enrolled full-time in a Ph.D. granting institution in any country. The student must be enrolled at the University during the Fall semester. Travel Awards: SIGDA and others have generously donated funds to secure travel and accommodation grants to assist students in entering the contest. Participants will receive either full or partial travel and lodging awards. Contest Awards: A first prize and an honorable mention will be provided to the best team and second best team. 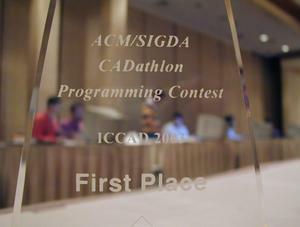 The awards will be announced on Monday, during the opening session at ICCAD. The winners and participants will be honored during the SIGDA member meeting on the evening of Monday too. Contest Participation: Several teams will compete against each other to solve some EDA related problems. Each team should have 2 people. The participants could be from the same school or different schools, but both MUST be (under)graduate students working in EDA. If you really want to compete and cannot find a partner, please drop an email to cadathlon at gmail.com. We will put a little effort in matching people up. You must complete a team application on or before October 1, 2018 to be considered for participation. Hardware/Software Setup: Each team will be provided with a computer with a specific Linux distribution. The exact release will be posted a week before the contest. Some software infrastructure may be released then too. Preparation Guidelines: More detailed information about the contest topics will be released a week before the contest. The organizing committee will then suggest a handful of papers as recommended reading material.